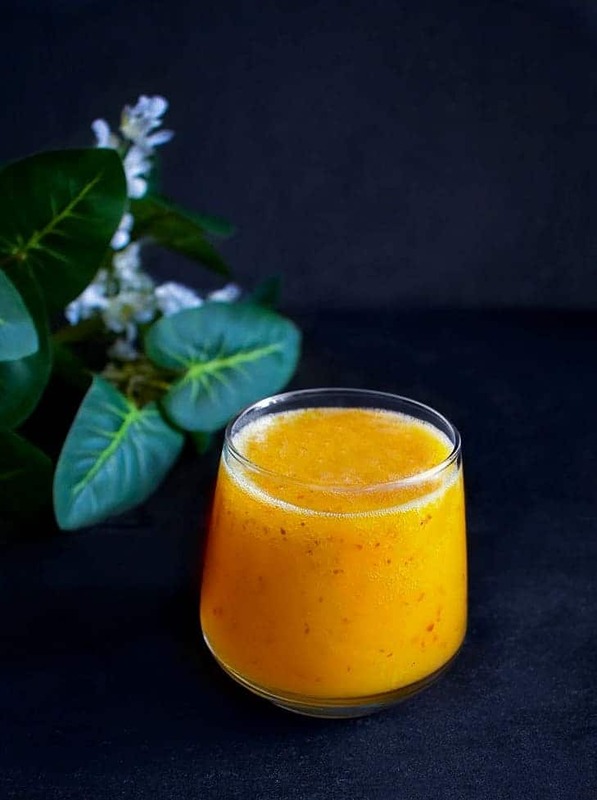 Turmeric Ginger and Apple Smoothie: absolutely delicious, light and packed with nutrients; this smoothie is a perfect way to jump-start your day. 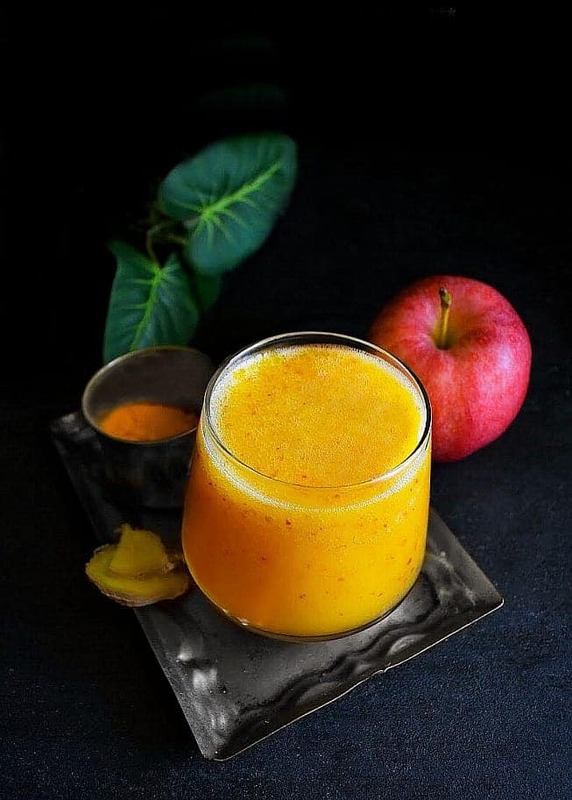 Turmeric Ginger and Apple Smoothie is water based and contains no gluten or added sugar. 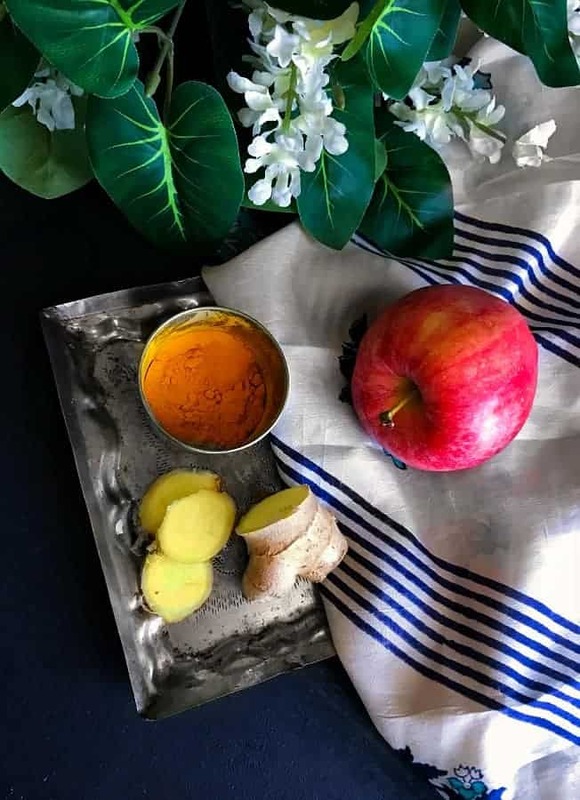 Fall/Autumn is our favorite season and this ‘Turmeric Ginger and Apple Smoothie’ is how we welcome the change in seasons. It’s time to move from chilled, tart, chunky, fruity smoothies to lighter, warm smoothies (in terms of flavors). 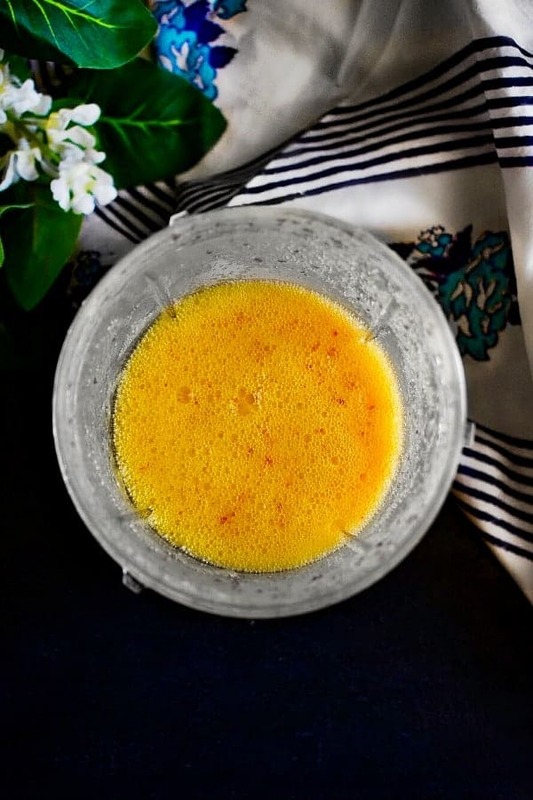 3 ingredients and you have yourself a delicious smoothie that’s great for light breakfast, snack or even an after meal drink! So, we got the power-packed smoothie and started our day all energized, but what about our heart health? 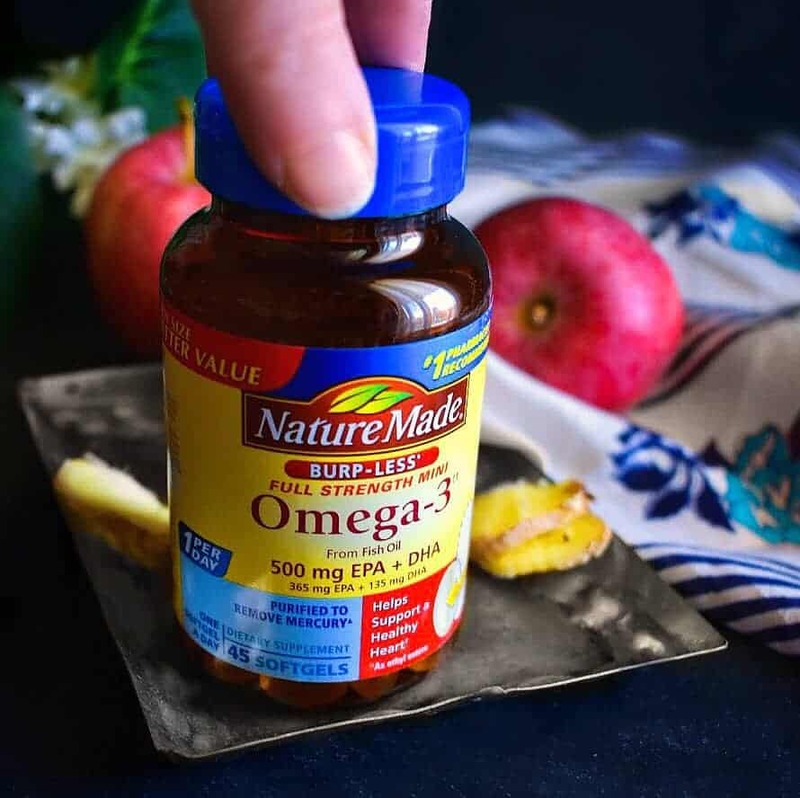 I have added these Nature Made® Omega-3 Full Strength Mini, 500mg EPA+DHA, Burp-less softgels to our daily morning routine (I got mine from Walmart). Fish Oil is a great source of naturally occurring Omega-3 fatty acids. Omega-3 fatty acids are healthy fats that should be included in most people’s diet. The two primary Omega-3 fatty acids found in fish oil are EPA and DHA. 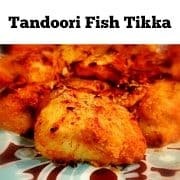 How Much EPA & DHA Do I Need? 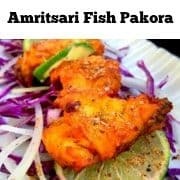 Heart health experts recommend consuming two servings of fatty fish per week for healthy adults. Always remember it’s actually the EPA & DHA Omega-3s from fish oil that counts! 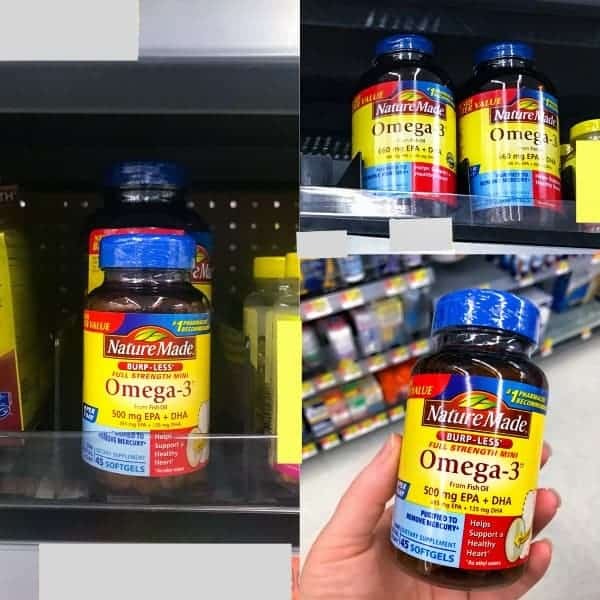 So, now at Walmart, you can find a selection of Nature Made® Omega-3 supplements that clearly call out the amount of EPA & DHA Omega-3s on the front of the label. With this change in labels, Walmart is trying to make it easier for shoppers like us, to navigate the “fish oil” segment & feel more confident we have purchased the right product. 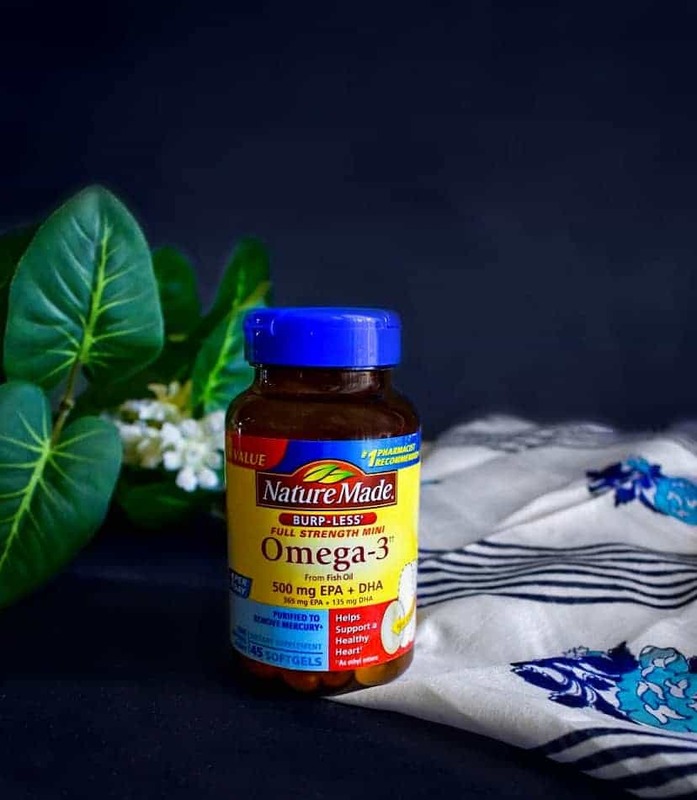 You can also text OMEGA to 555888 to check out a quick video from Nature Made® on their Omega-3 supplements at Walmart. 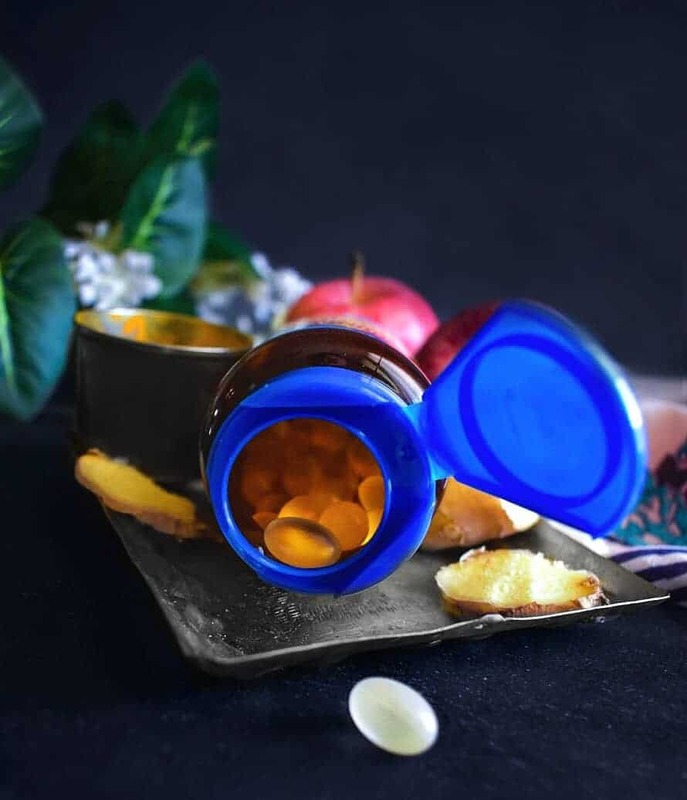 For more questions like “What’s the best omega-3 supplement for you?” You may want to discuss that with your healthcare professional, especially if you have heart concerns. Nature Made®’s burpless formula is specially coated to help prevent a fishy odor and aftertaste. 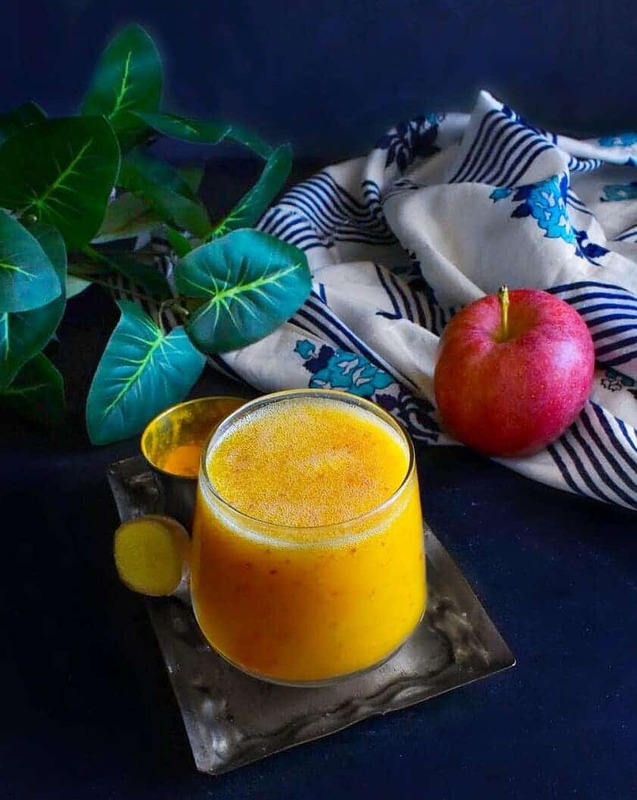 Now, that we have discussed how to REALLY jumpstart our day with a healthy heart†, let’s get back to our Turmeric Ginger and Apple Smoothie. 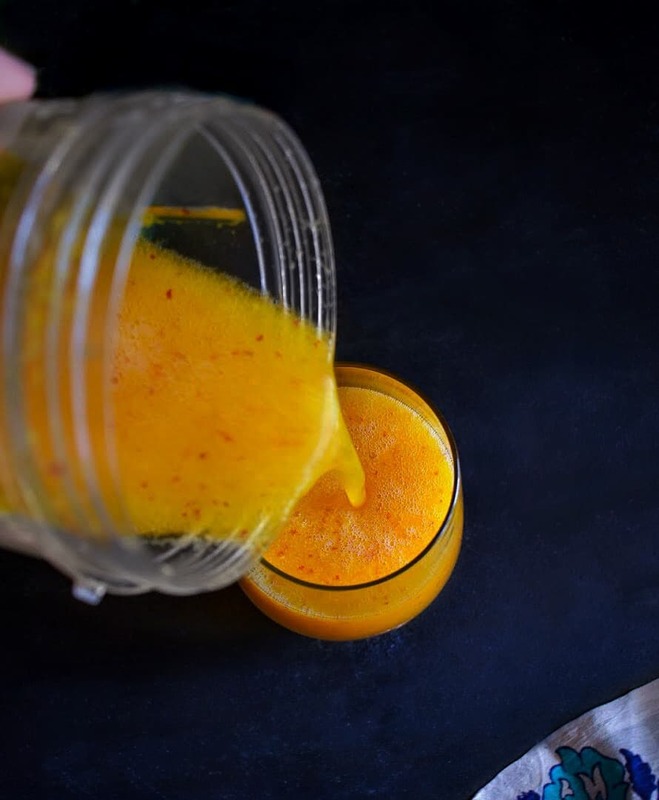 Turmeric is anti-inflammatory, heals our body and help fight free-radicals. Ginger is a natural immunity booster and helps in detox too, along with soothing our digestive system. Apple is loaded with vitamins, iron, and heart-healthy properties. To keep the smoothie closer to its natural taste, I’m not adding milk/milk-substitute or even yogurt. Instead, I’m using plain water, but if you still want to add something else, you may add natural coconut water. Here’s a Tip: you can even use warm water in this smoothie on colder, winter days and just sip it like tea/coffee. 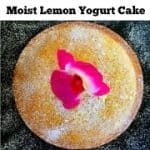 Once you have all your ingredients, just blend everything together in a blender for 1-2 minutes or until smooth. 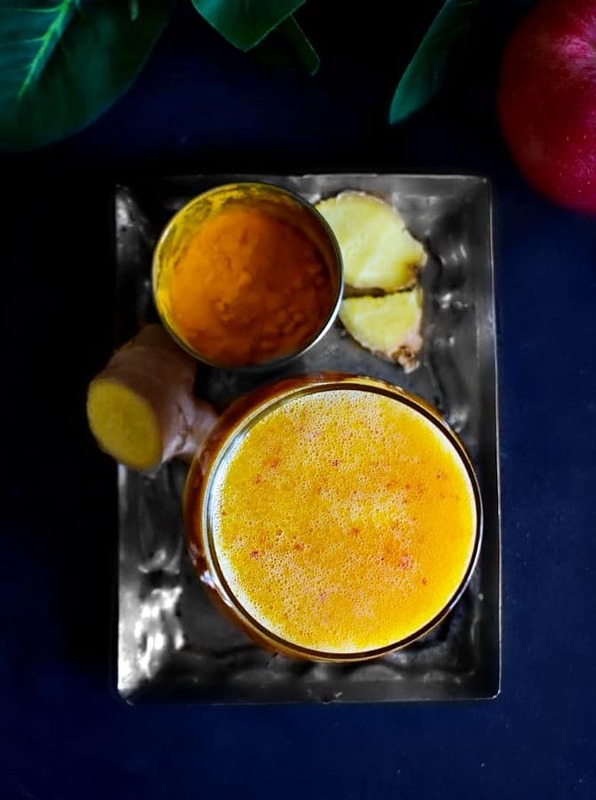 You can drink this Turmeric Ginger and Apple Smoothie as is or if you like a thin/non-fiber smoothie, you can simply use a sieve. I highly recommend drinking it as is with all the fiber for digestive benefits. 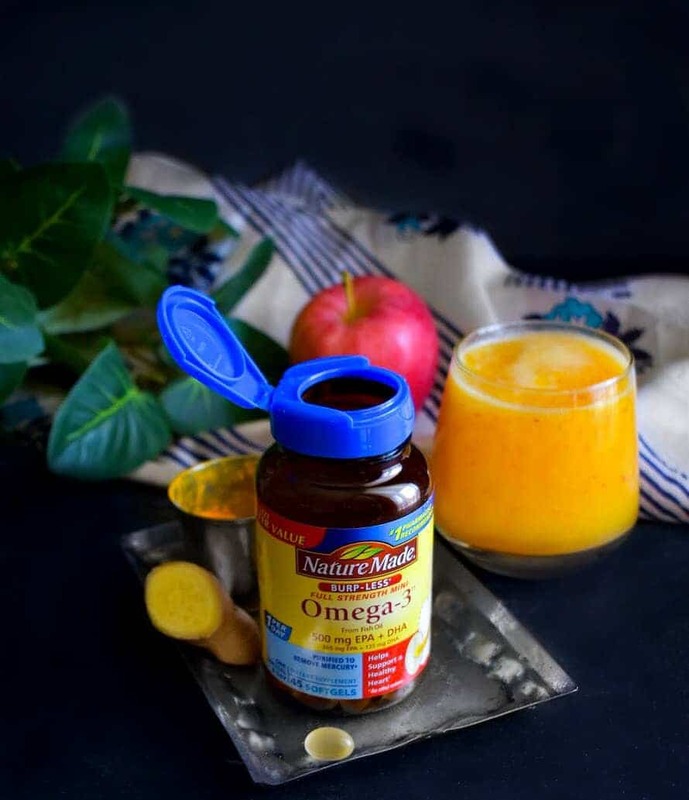 So go ahead, try the Turmeric Ginger and Apple Smoothie and visit your local Walmart today to buy the Nature Made® Omega-3 supplements! You can text OMEGA to 555888 to check out a quick video from Nature Made on their Omegas at Walmart. Absolutely delicious, light and packed with nutrients; this smoothie is a perfect way to jump-start your day. Pulse to form a smooth mix. 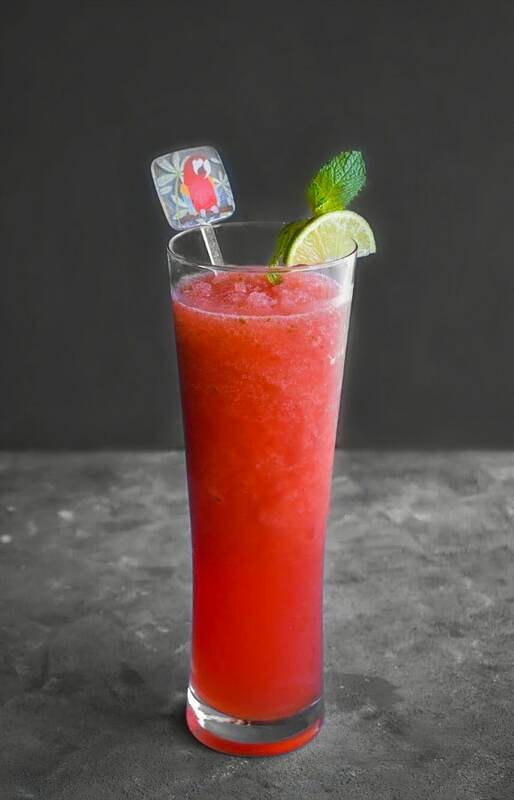 Turn off the blender and pour in serving glasses. 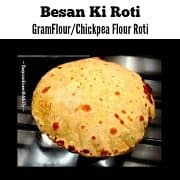 Enjoy Fresh or store in the fridge upto 2 days. 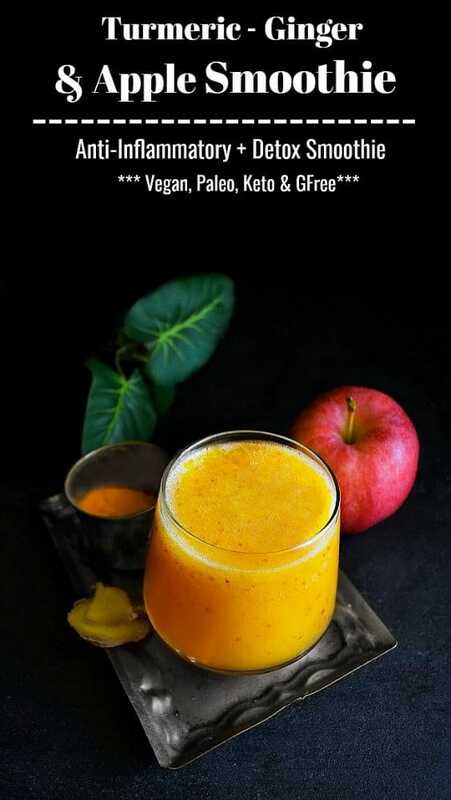 4 Replies to "Turmeric Ginger and Apple Smoothie"
Wow! Love this healthy smoothie. 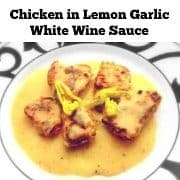 I’ve been looking to use turmeric more. This is perfect! Pretty sure I need to start every day with this smoothie! I’ve also never considered using hot water in my smoothies on a cold day, so I definitely need to try that!